Dexter The Dog and his BFF Levi visited the South Shore along Lake Michigan and spent the day at Fair Oaks Farms. 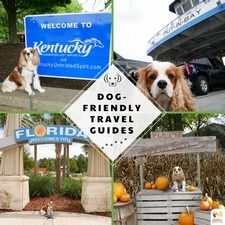 When I’m planning a dog-friendly road trip, I always try to find unique dog-friendly attractions. Fair Oaks Farms more than met my expectations. Fair Oaks Farms is a working farm focused on transparency, reduce, reuse, and recycling efforts. Their goal is to achieve a zero carbon footprint. Fair Oaks Farm is extremely proud of their farming efforts, and in 2004 they opened their doors to the public. They are recognized as the #1 agritourism destination in the Midwest. Visitors can experience agriculture through their various activity centers. They host various events all year long including concerts and fun adventure activities. Farm guests can experience Fair Oaks Farms at their own pace. With acres of fun both indoors and out, you and your dog will have a doggone good time. Dogs are encouraged to visit the farm’s outdoor attractions and walking paths. Because of the food production, indoor attractions are reserved for humans only. The Farmhouse Restaurant offers fresh farm-to-table meals created from Fair Oaks Farms and other local farms. Their fresh American farm cuisine menu has something for everyone. You can find menu items such as a cheese board, baked spinach dip, ribeye burger, Indiana pork tenderloin sandwich, pizza, corn dogs, corn on the cob, and a variety of soups. The Farmhouse Restaurant allows dogs on their outdoor covered patio. After eating, head over to the Dairycatessen for an ice cream treat. If you didn’t fill up at The Farmhouse Restaurant, the Dairycatessen offers grab-and-go sandwiches and salads and offers a large selection of local beer and wine. Behind the Dairycatessen is Central Bark dog park, which is free for all travelers. Central Bark park is a one-acre fenced-in dog park. Inside you will find watering troughs, agility equipment, benches, potty waste bins, and shade areas. Dexter and Levi enjoyed an afternoon of walking the Fair Oaks Farms grounds and checking out all the sights. I was in photo-op overtime! There were so many fun and quirky sculptures, I just couldn’t resist. If you are looking for a fun road trip with your dog, I highly recommend visiting Fair Oaks Farms. You won’t be disappointed. Visit Fair Oaks Farms with your dog today! 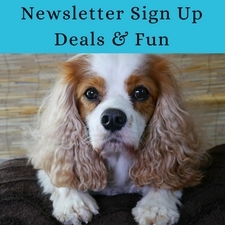 When planning your dog-friendly South Shore Indiana vacation, visit AlongtheSouthShore.com for helpful advice, brochures, and coupons. What a fun place to visit! It looks like there are tons of places to get good photos in. I love those old trucks. Lots of great photo ops for sure. The trucks were really neat. For non-dog people, there are lots of neat adventures indoors too. 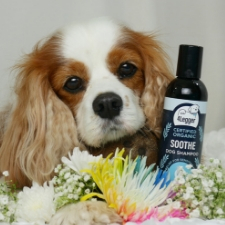 Do you know that Cavalier King are my favorite dogs? 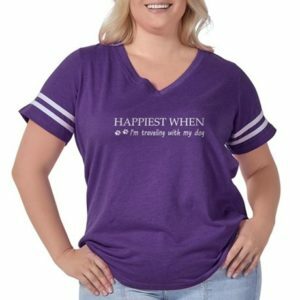 Your dogs are beautiful and read of your trip is wonderful! Awe, thanks. Cavaliers are really a great breed. I appreciate your kind words. Fair Oaks Farm looks like so much fun. Even I would love to visit. I am sure your dogs enjoyed the trip. They had a blast. Yes, a great spot for families of all ages. Your dogs are so cute. I am amazed that they sit still for the pictures. Oh my goodness what a road trip with two cute dogs. I love that there are so many dog friendly places to go tripping now, I never like leaving my pooch behind. Thanks. Oh, we had so much fun. Each year I find more and more dog-friendly attractions. It’s a blast! Okay this is so cute 🙂 I absolutely love your travel adventures anyway – but the photos of the two of them?! They’re all so gorgeous! We adore Fair Oaks Farm! We will be visiting again soon to check out their new hotel and restaurant. Thanks, Cheryl. We had so much fun. The hotel looks very nice. Fair Oaks Farms was such a great day. Yes, humans would have just as much fun as the pups. Your blog inspires me to find dog-friendly places in our area. I would love to take a trip with our new puppy. Ya! So glad! Check with your local tourism bureau. They are a wealth of information. You know I have never visited Indiana before now I am inspired an even more as I can bring my dog Bella with me. Loving all your pictures and your dogs are beautiful. Thanks, Lindsay. It was a great day out. So much fun for all of us. Thanks, Joanna. Fair Oaks Farms definitely ensured there were plenty of things for us to see and do. Your kids would love it! Very kid-friendly too. That looks like fun! I want to travel more with my dogs. My favorite dog friendly place we have been is Nashville, TN! I definitely want to go back. We had a blast! I love Tennessee too. I haven’t been to Nashville, I’ll have to check that out. I love all the pictures! Fair Oaks Farm looks like an awesome place to visit. I love reading about pet friendly travel destinations, even if I’ll most likely never get there myself. With all the pets I have, plus work and such, we don’t really get to do much traveling. Thanks, Michelle. It definitely takes time to travel. I’m a one dog Mom, so I don’t have so many to juggle. I will be writing about traveling with more than one dog in the future. Love the pictures and it looks like the dogs had a blast! I think it’s wonderful what an effort Fair Oaks Farms made to make it so dog friendly. I imagine they get a lot more visitors because people no longer have to leave their pups at home. Thanks, Hindy. I agree. When places truly welcome dogs, more travelers are bound to explore more. No worries about leaving the dogs at home, in the car or hotel. The puppies are so darn cute and photogenic! How nice is it that you and the dogs could both enjoy yourselves at the Farm! I wish I had more travel opportunities for my two pups in the Orlando area. Such a great place. Pets are totally gonna love it. I love your choice. Thanks, Monidipa. Fair Oaks Farms is a perfect destination for dogs. 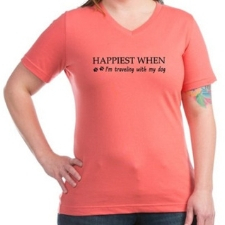 I have four dogs so it’s impossible to travel with all of them, but this looks really great! Thanks, Nina. 4 at a time could definitely be a challenge for one person. I just love following the adventures of these furry travelers! What a great dog-friendly location! Thanks, Stephanie! We really enjoy sharing our trips. Thanks, Ruth. Layla would have a blast. This is such a fun place! Your pups are so cute! I have a golden who loves going outside of the city and explore. Fair Oaks Farms was a blast. You should take your golden, so many things to explore. We went to Fair Oaks Farms a couple summers ago. My kids really liked the pig tours. Hi Rachel. That’s fantastic! It’s such a great family-friendly spot. These two little ones just look like having so much fun. They must be great companions to travel with. Thanks, Anshul. They really are best friends. 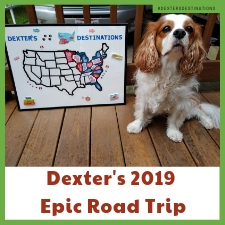 When Dexter’s friend sees his mom pack is travel crate, he gets all excited and starts spinning! wow, the place is so cute and awesome for pets. They will definitely love it. Cute dogs and that’s good that you can bring them with during vacation. Thank you, Laurence. It’s so nice to have a great spot like Fair Oaks Farms welcome our dogs. It makes traveling so much more enjoyable. What a unique take on travel! 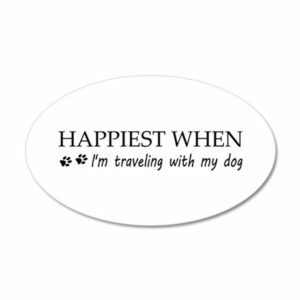 I love that you travel with your dogs! Moreover, they look so well behaved! Perfect travel companions! Thanks, Brittany. Both pups are continually learning their manners and tricks. They are well-traveled and really enjoy the adventure. That looks like it was so much fun. Your dogs are so adorable! Thanks. We had a blast! The pups really enjoyed all the things to see and sniff. Great post and pictures! It’s great that so many places are dog friendly. Looks like a fab trip for our furry friends. Thank you, Louise. More and more spots are opening their doors to the other members of our family. It’s so nice to see. What a fun place to see and SO many lovely photo ops! Very “Instagramable” LOL As vegans we always struggle with farms in general but …. I think this one might just be worth a drop in if we are ever in the area. A long way from Canada! Thanks. It’s really a lot of fun taking photos of the pups. I travel with a cat. I’d love to visit Fair Oaks Farms – we’d have a blast. It’s such a great spot to visit! I’m sure your cats would have a blast! Wow so so cute! I don’t have any experience travelling with pets but I love animals and think this is very sweet. Great article with so much information on where to explore! Thanks, CJ. I’m glad you enjoyed my post. What a cool place to vacation! We especially like Central Bark! Dexter and Levi look like they’re having a ball. Central Bark looked really nice. It was very big. Fair Oaks Farm looks like an awesome place to visit! I love the pic of Dexter and Levi sitting in front of the silo! The wind is whipping their beautiful fur 🙂 Makes me want to visit – so lovely! Thanks. That’s one of my favorites too. We had such a great time. Great photos. This place looks filled with fun to visit with your pet. Thank you for sharing this. Thanks. Fair Oaks Farms was such a great attraction. Ah I’ve always wanted a pup to go on a roadtrip with. What lucky doggos you have! Thanks, Kaitlyn. It’s so much fun! It looks like it was such a fun day! I love all the photos you took, especially with the old trucks. Thanks, Beth. I loved those trucks! What a fun road trip! Fair Oaks Farm looks amazing! Great pics, too. I especially love the one of them on the old green pickup. What a great Christmas holiday card that would make! I find visiting farms so relaxing. My sister has a 32-acre farm and I love to sit on the porch and watch the animals. This isn’t a life style I’d want, but it is comforting. Glad you found a great place to visit. Wow. That’s quite a farm! Yes, lots of work. It’s great that there are people out their that care for the animals they farm with. First of all, your dogs are so adorable. Visiting farms must so interesting, most likely fun too, and I love you the look of your truck. I know someone who would love an old truck like that. Thanks, Amara. They really had a great time sniffing around. Us humans loved all the information Fair Oaks Farms had to offer. A great day.